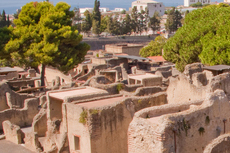 Discover the ancient lifestyles and the ongoing explorations of Herculaneum. The town was lost, along with Pompeii, in the eruption of Mount Vesuvius. Not a knowledgeable or entertaining guide, forced into a cameo factory & shop. Not a knowledgeable or entertaining guide, forced into a cameo factory & shop. Would have been better off with an audio guide. The Herculaneum trip we did through Royal Caribbean was excellent. The Herculaneum trip we did through Royal Caribbean was excellent. The tour guide was fantastic. Would have preferred not to have stopped at the Cameo factory - but the actual visit to Herculaneum was brilliant - very interesting indeed. Car picked us up at the port and drove us to Pompeii. The tour site itself is good. Our tour guide for this tour was brilliantly funny and provided a lot of historic detail on the Herculem city. It was extremely interesting and i would definitely recommend this tour to anyone going to Naples via RCCL. The tour to Herculaneum was excellent. The tour to Herculaneum was excellent. This site is much different from Pompeii, so I recommend that you see them both. Very interesting place, and we had a good guide. If you have a bit of courage you can reach Herculaneum by your own means, and thus save the expensive P & O excursion. On the other hand it is all done for you, and a guide is handy, so all in all we found it worth it. Amazing archaeological site. Great tour guide. The vision of the skeletons is till with me. Our tour guide was a college professor. Good trip and guide could have done without the cameo factory tour and more time in Herculaneum. Herculaneum is really one of my favorite ancient ruins. We found this tour more interesting than Pompeii. We booked a private car because we wanted to go to Herulaneum and Vesuvius and there wasn&apos;t an excursion for both options. APTours was very helpful and our driver was excellent. Level 3, 3.5 hours I talked my husband into this tour, thinking Pompeii would be crowded. Great view of the city buried along with Pompeii. My personal trip high point. The tour was informative and everyone was surprised at how well preserved much of the town was. afternoon after morning tour to Pompeii. afternoon after morning tour to Pompeii. Had to return to ship instead between tours. Viking should coordinate this better so you don&apos;t waste time like that. Actual tour was fine. Liked Herculaneum. Hard to hear and understand the guide. Wished we could have visited the bones. We were unable to walk to Mt. We were unable to walk to Mt. Vesuvius crater, as there was heavy fog. Our driver took us to this site instead. It was interesting but so far from the port. It was unguided and I feel that I missed a lot of the information. Just 8 or us with a Driver. Just 8 or us with a Driver. Although it was a good day and the driver was knowledgeable and entertaining, I think we all wished we had a guide in Herculaneum. A good trip if you have already been to Pompeii.